Though we start our tours at 10 AM at the Pike Place Market, many people ask us what time the Pike Place Market is open. 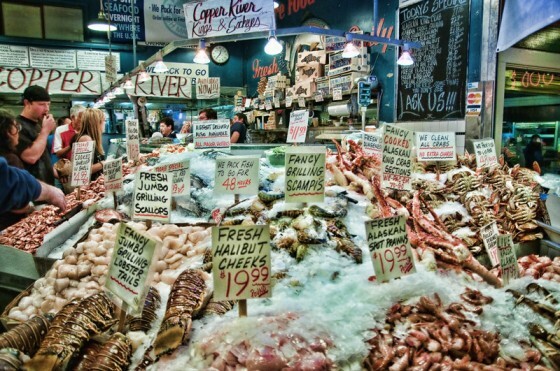 One can see vendors arriving as early as 6 AM, especially for the Fish Mongers at Pike Place Fish. They get an early start so they can start chopping ice, which is a tougher job than you might think. Their hands are cut up from the day before getting up early and chopping ice. You can usually start making your purchase at the fish and produce stalls at 7 AM. Pure Food Fish Market – This is our favorite place to get smoked salmon, so if you need something to grab and go in the morning, this might be the perfect place to get an early morning treat. They also have one of the best websites for any business in the market with a great blog and recipes for seafood. One can get an early breakfast at the market as early as 6:00 am. For a few early morning restaurants,7 AM you might want to check out the following. Starbucks – The original Starbucks store keeps to its roots and only serves coffee and espresso, but you can purchase food at many of the local vendors in the Pike Place Market. La Panier – Billed as a “Very French Bakery” this is a wonderful location to start your day off. Here are just a few tasty items you can enjoy there. Croissant au beurre – always, only with butter. Pain au chocolat – French chocolate, of course. A l’abricot – filled with apricot preserves. A la framboise – filled with raspberry preserves. Chocolatine – chocolate with crème d’amande. Roulé aux noix – croissant with walnuts. Brioche- buttery egg bread. Tresse & Brioche Nantaise on weekends. Pain aux raisins – croissant with sugared raisins. Croissant aux fruits – pastry cream topped with apples or apricots. The Athenian – Reasonable prices, great breakfast menu and an icon in the market since 1909. The Athenian was also on the big screen where a scene with Tom Hanks and Rob Reiner was filmed. Plaques were installed to denote the exact location where filming took place. This is the corner of the restaurant’s counter, right near the main entrance. Lowell’s Restaurant & Bar – They have a great breakfast menu here and have some great seafood choices for breakfast including House Cured Wild Salmon Lox and a Northwest Dungeness Crab Eggs Benedict. Once you get your day started in the market, you can expect most places to be open until 6 PM. After this it’s mostly the restaurants and bars in the market that continue operation until the above last call at 1:30 and closing at 2 AM. Technically the Market is open 19.5 hours a day, 362 days a year. The Pike Place Market is closed on Thanksgiving, Christmas and New Year’s Day. This entry was posted in Meet the Market and tagged pike place market hours, pike place market hours of operation. Bookmark the permalink.